On an early morning run in 2015, Dr. Abby Huggins Mowinski stumbled upon a little dog dodging traffic near her home. Three years later, that same pup runs right alongside her every morning! High-energy, four-year-old rescue pup Tesla and Abby were made for each other. As a veterinarian and a competitive triathlete – Abby knows how to keep Tesla happy and healthy while enjoying the right amount of activity together every day. Dr. Abby is a veterinarian at Intown Animal Hospital in Atlanta, Georgia – located on a cozy dog-friendly street, with The Family Dog restaurant next door. Her patients come in all sizes, breeds and ages, and she says that the most important decision you can make for your pet is what nutrition to feed them. What she chooses to put into her body translates to faster swims, faster rides, and faster runs during her IRONMAN races – and she believes the same goes for her patients and her own pets. Abby enjoys life in Atlanta, GA with her husband Todd, boys Nathan and Jack, and Nulo athletes Tesla, O.G., and Mason. Abby serves a complete meal of MedalSeries Adult Lamb, Adult Salmon, and Beef with Coconut Jerky Treats to Tesla. 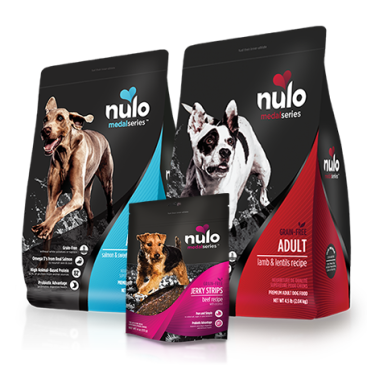 Real meat in Nulo recipes satisfies pets’ cat's appetites and gives, them the energy they need to hunt and play.